Showmax is a live TV streaming Android App that gives you quick access to a great selection of TV shows, movie series, kids shows, and documentaries. If you love to watch/download full HD movies and TV shows with your mobile device then this application is a must-have on your Android smartphone. Greatly, Showmax is compatible with almost all devices including tablets along with Google Chromecast features. This app is specially designed for the movie lovers who would like to watch movies on a wider screen because it's Chromecast enabled. If you confused about what series or shows to watch, Showmax App has a recommendation engine that can help you find the perfect and trending show quickly. Also if you have a smart TV and looking for the best app to connect it to Android device in order to access all the most popular TV channels from Android smartphone, here you have stumbled upon a great solution. The Showmax app has the ability to curates a huge collection of movies and TV shows for all Authorised Users to quickly download them to their smartphones and tablets to watch later without the need for internet connection (offline). That means; you would need to register an account with them and activate (subscribe) to their monthly subscription packages. This app also allows you to stream, download conveniently with less data consumption as it comes with a standalone bandwidth capping feature. 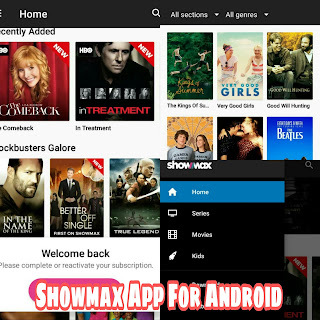 Showmax is a free app in Play Store but to get limitless options for movies or TV show to stream and download, you have to sub for their monthly packs of R99 (Showmax subscription). The app is available in Google Play Store, this means all Android smartphone users including Afrikaners looking for Showmax South Africa can now easily download it from Play Store. Download Here - Showmax App for All Devices. After the installation, go to the Showmax catalog ==> tap on activating my account ==> Create a Showmax account ==> activate and sub for a monthly pack of R99 to gain access to a huge online selection of TV shows, movies, kids shows, and documentaries. That's all, If you love watching/downloading movie and TV show then you should install this awesome app on your Android phone and thank me later. Thanks for stopping by, do remember to share with your friends.